Join in on the summer fun with the 4th of July Slot Machine game and be sure to set off colourful fireworks with every win! 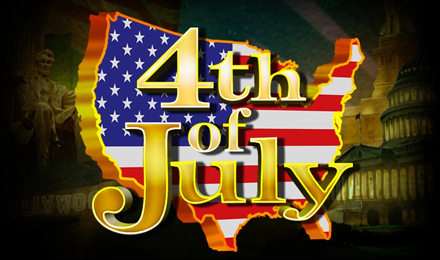 Explode onto the scene with the FREE 4th of July Slot Machine game. With 5 reels and 9 paylines you can celebrate the famous American summer holiday in sizzling style by playing hard and winning even bigger. Activate free spins and majorly bombastic bonus games by setting off 3 or more celebratory rockets. Unlock waving US flags, Free Spins, and Wild Symbols to make for even better combinations in this happy game from across the pond. Follow the red, white, and blue to big winnings!